Posted Feb 08, 2018 by Eds. Every year, human activity moves more sediment and rock than all natural processes combined, including erosion and rivers. This might not shock you. In fact, you’ve probably seen similar soundbites circulating online, signals of the sheer scale of how we’re terraforming the planet in the era of the Anthropocene. 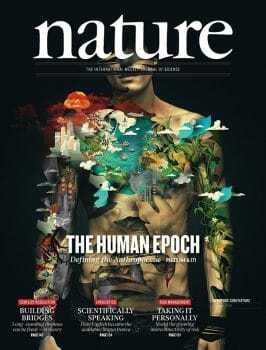 Natural and social scientists argue passionately about almost everything Anthropocenic, from the nuances of nomenclature to the start-date of the new geological epoch, but most agree on one thing: the Earth will outlive humanity. What’s in doubt is how long we will populate the planet, and under what conditions. But who, exactly, are ‘we’? 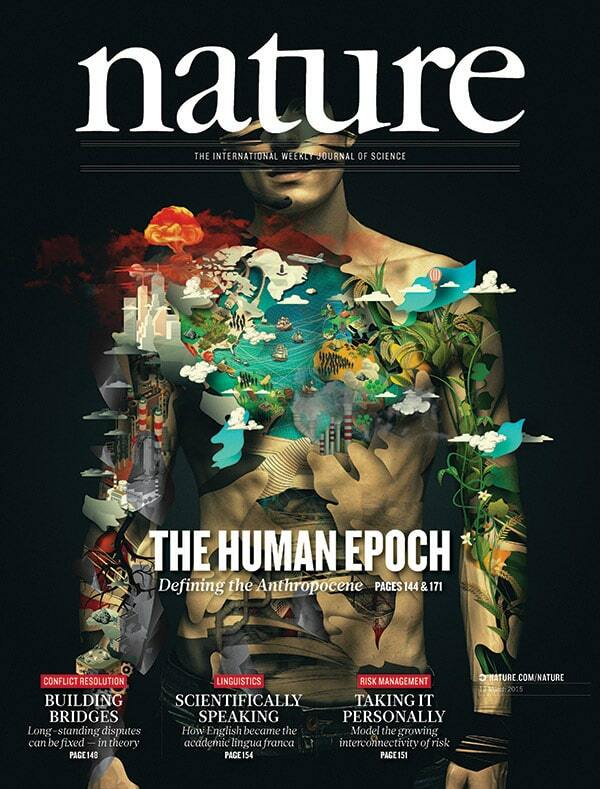 Consider the cover of Nature in March 2015, in which two Earths, one blue-green and one grey, are entangled in a human body. The title emblazoned across the man’s six-pack invites us to see this body as representative of ‘the human’. But there’s no such thing as a generic human, of course; the image repeats the centuries-old conflation of human with white man. Perhaps the artist sought to subvert such racist overtones by obscuring the man’s eyes, making him an unseeing subject blind to the damage he’s wreaked on his body and his planet. Still, the image impels a common critique of the Anthropocene concept: it attributes ecological collapse to an undifferentiated ‘humanity’, when in practice both responsibility and vulnerability are unevenly distributed. While the Anthropocene continually inscribes itself in all our bodies – we all have endocrine disruptors, microplastics and other toxic things chugging through our metabolisms – it manifests differently in different bodies. Those differences, along with the histories that generated them, matter a great deal – not just to the people who suffer from them, but also to humanity’s relationship with the planet. What picture of the Anthropocene, for example, emerges when we begin our analytic adventure in Africa instead of in Europe? Minerals from Africa played a big role in motivating colonialism and powering industrialisation. Their extraction fuelled the Anthropocene. Saying that ‘we’ move more rock than all natural processes combined doesn’t even begin to capture these violent dynamics. Who actually moved the rock? How did this movement affect the people and ecosystems around the mines, not just at the time of extraction but decades later? Africa is a large continent with a complex history, and answers differ by place and time. So let’s begin by considering two minerals with global significance: gold and uranium. A common means of exchange for centuries, gold became a major lubricant of industrial capitalism, underpinning national currencies in Europe and North America during periods of massive industrial expansion and investment. Uranium, for its part, fuelled the Cold War. Some of the waste from its fission in power plants and weapons will remain radioactive for more than 100,000 years – a clear flag of the Anthropocene epoch for future geologists (if there are any). Over the course of the 20th century, South Africa’s Witwatersrand plateau – known more commonly as the Rand – supplied ample quantities of both minerals. Industrial gold mining began there in 1886. During the century that followed, hundreds of thousands of men migrated to the Rand for work, tunnelling deeper underground than anywhere else on the planet and making South Africa the world’s top gold producer. Workers lugged ore to the surface through narrow, hot, poorly ventilated stopes. Many lost their lives to rock bursts. Among those who survived, tens of thousands contracted silicosis from breathing dust year after year. The term did not yet exist, but the Anthropocene was nevertheless etching itself into the lungs of generation after generation of young African men. In the early decades, much of the rock hauled so laboriously to the surface was too low-grade to justify processing costs. These residues (known in the industry as tailings) were dumped near the shaft openings. By the 1930s, enormous tailings piles had reshaped the region’s topography. In the months of July and August, winter winds blew dust from these dumps across the plateau and over the urban sprawl around Johannesburg. Recognising the mounting pollution problems, a handful of botanists looked into how to vegetate the mine dumps to prevent erosion. But their efforts remained underfunded for decades, eventually shut down altogether by their opponents in the mining industry. This too followed a quintessentially Anthropocenic dynamic, one that has operated since at least the 19th century: industries knowingly pollute; scientists investigate the extent of the pollution and propose solutions; industries, often with state approval, deem mitigation too expensive; scientists are starved of resources; the problems are ignored. After the Second World War, rocks previously deemed waste acquired new economic value. Bound in their matrix was uranium, the element whose fission had levelled two Japanese cities, Hiroshima and Nagasaki. The gold industry rejoiced to discover this new source of revenue. In 1952, South Africa’s new Apartheid government launched its first uranium-processing plant with considerable fanfare. In short order, the tailings piles yielded 10,000 tons of uranium oxide, which was exported to the US and the UK for their nuclear arsenals. Today, much of this uranium remains locked in ageing missiles. But during the frenzied nuclear-testing of the late 1950s and early ’60s, some of it exploded in the atmosphere, plummeting back to Earth in the form of chemical products created by fission. Today, earth scientists searching for indicators of a definitive break from the Holocene argue that these radioactive deposits constitute the ‘golden spike’ that marks the start of the Anthropocene. At least two of South Africa’s contributions to the Anthropocene, uranium and gold, are distributed all over the planet. But the consequences of these contributions for South Africans have barely begun. Pierced by hundreds of shafts and tunnels, the Rand has become what the architect Eyal Weizman at Goldsmiths University of London calls, in a different context, a ‘hollow land’. And hollow lands are treacherous. Over time, water has filled the abandoned stopes, where it reacts with the pyrite in the exposed rock and becomes acidic. Heavy metals previously trapped in the conglomerate rock – including known toxins such as arsenic, mercury and lead – readily dissolve in the acidified water. This toxic soup has been rising steadily; in many spots it has ‘decanted’ onto the surface or into the water table. Thousands of people – farmers, informal settlement residents, and others with no access to alternative sources – use this water for irrigation, drinking and bathing. And while many of the tailings dumps have been remined, many still remain, unvegetated. The winter winds still blow dust – some of it radioactive, with uranium residue – across the farms, settlements and suburbs. For the 14 million residents of Gauteng province, mine residues form a major signature of the (African) Anthropocene. As African minerals continue to fuel industrialised life across the globe, the toxic residues of their extraction plague communities throughout the continent. Take the Niger delta, one of the world’s most significant sources of petroleum. In the past half-century, more than 7,000 oil spills have contaminated water, land and communities in this vast region. Converted into fuel and poured into gasoline tanks, this oil generates additional Anthropocenic signatures that also scream for attention – particularly in dense urban conglomerations such as Cairo, Dakar, Lagos and Nairobi (among many others). Residents of these cities spend hours working and commuting in fearsome traffic jams, inhaling the diesel fumes emitted by mopeds, taxis and buses. The problem steadily worsened in recent decades, closely following the continent’s increased pace of urbanisation. According to one recent report, the annual premature death-rate attributable to outdoor pollution in African cities rose by 36 per cent between 1990 and 2013; current estimates put it at a quarter of a million lives a year. Air pollution is by no means unique to urban Africa, of course. It’s at least as old as British industrialisation, powered by exponential increases in the extraction and burning of coal. Some researchers date the start of the Anthropocene to around 1750, when the first massive displacements of carbon into the atmosphere began. A century and a half later, Claude Monet’s painterly renditions of the British Houses of Parliament depicted the colourful consequences of this displacement, refracted in the dense smog of late 19th-century London. In 2017, the prestigious medical journal The Lancet published a robust research report that showed pollution is the world’s leading environmental cause of disease. Pollution caused some 9 million premature deaths in 2015, and 16 per cent of all deaths worldwide – ‘three times more deaths than from AIDS, tuberculosis and malaria combined, and 15 times more than from all wars and other forms of violence’, the report added. The vast majority of these deaths took place in low- and middle-income countries, and in the poor communities of rich countries. None of which should come as a surprise. Chances are you’ve seen photos of masked residents in Beijing and Delhi struggling through grey and brown air. Yet despite similarly hazardous breathing conditions, African cities rarely turn up in media reports about urban smog. Just take a look at Wikipedia’s entry on smog: you’ll find paragraphs on cities in North and South America, Europe and Asia, but not a single mention of Africa at the time of writing. Similarly, scientific research pays disproportionately little attention to African cities. In part this is because of the difficulty in obtaining good data, due to the near-absence of infrastructures for monitoring air quality, but that is not the only reason. Among large sections of the scientific community, there’s a tacit assumption that since so much of Africa is rural, outdoor air pollution isn’t a major concern. But Africa currently has the highest rate of urbanisation in the world. So the casualties from outdoor air pollution are climbing quickly, and will continue to accelerate. The ultra-rapid growth of cities intensifies pollution problems, especially in poor countries, where public services can’t keep up with the population increase. Many city-dwellers inhale a toxic synergy of both outdoor and indoor air pollution, the latter from burning the likes of wood, coal or plastics in the home – another way in which the Anthropocene etches itself onto African lungs. Consider the example of Ouagadougou, the capital of Burkina Faso, where a team of researchers has been studying ambient air pollution for the past few years. The population is projected to grow by 81 per cent between 2010 and 2020, when the city is likely to reach 3.4 million people. Most of Ouagadougou’s new residents live in informal settlements, with no electricity, water or sanitation. Lacking access to modern infrastructures leaves them with few choices. They must burn fuel on open fires to cook. To earn their livelihoods, they must travel unpaved roads, where dust exacerbates the effects of other pollutants. Lower respiratory infections form Burkina Faso’s leading cause of death. Ouagadougans are not alone. Respiratory and other health problems posed by ambient particulate matter – composed of compounds such as sulphur dioxide, nitrogen dioxide and black carbon – are well-known. For several years now, the World Health Organisation (WHO) has flagged pollution as the world’s most severe environmental health problem, one whose effects were intensified by poverty. Yet, as critics have noted, the WHO does not have air-quality programmes in place for sub-Saharan Africa, though it does for Europe, the Western Pacific, and the Americas. Scientific studies of outdoor air pollution in African settings – although ramping up in recent years – still remain few and far between. Of course, urban pollution is both visible and palpable to those who experience it firsthand. The residents of Port Harcourt in Nigeria – no strangers to smoke from the oil refineries and other factories that dominate their city’s economy – certainly noticed when the smoke grew denser and darker in late 2016, enveloping the town in layers of soot. They noticed the black phlegm they coughed up in the mornings, and the black powder that covered their food and homes. They felt the stinging in their throats and the labouring in their lungs as they wheezed their way to work. Furious in the face of government inaction, some took to social media with the hashtag #StopTheSoot. Thanks to this and other forms of activism, the problem became more visible, but the soot has not disappeared. B eyond the particularities of any single case, systemic issues remain. Until recently, the inattention to air quality in African cities helped to obscure a startling fact. The diesel fumes emitted by motorists in Accra, Bamako or Dakar contain substantially higher proportions of deadly pollutants, measured in parts per million, than those breathed by denizens of Paris, Rome or Los Angeles. This is not a matter of consumer choice or carelessness. Rather, the high contaminant content results from a deliberate strategy on the part of fuel brokers such as Trafigura and Vitol. These commodity traders blend the fuel stocks that they purchase from refineries, using different recipes for different destinations. Taking advantage of relaxed (or non-existent) regulatory limits across much of Africa, commodity traders maximise their profits by creating high-sulphur blends that are outlawed in Europe and North America. The Swiss NGO Public Eye found that some amalgams in Africa contain up to 630 times more sulphur than European diesel. Much of the blending takes place in the giant port region of Amsterdam, Rotterdam and Antwerp, but the process is so cheap and easy that it can be conducted on ships, off the West African coast. Traders unabashedly name these blends ‘African-quality’ fuels, as they are saleable only on the continent – often in the very same countries that produced the initial stocks of crude oil. Such ‘dirty diesel’ is a significant part of why Lagos air contains 13 times more particulate matter than London air. When these practices were documented by Public Eye in 2016, brokers insisted that their actions were legal. Which was true. European limits on sulphur in fuel stood at 10 parts per million (ppm). North America offered polluters a bit more leeway, with 15 ppm. Across Africa, however, the average limit was 2,000 ppm; Nigeria, the continent’s largest oil producer, had a standard of 3,000 ppm. By leveraging these differences, commodity traders engaged in an utterly ordinary profit-maximisation strategy known as ‘regulatory arbitrage’: avoiding legal restrictions in rich countries by moving manufacturing and waste to poor countries. In this case, media attention mattered. In November 2016, Ghana lowered its sulphur standard for imported diesel to 50 ppm. The city of Amsterdam voted to ban the blending and export of fuels whose contaminant content exceeded EU limits. In December, the United Nations Environmental Programme (UNEP) convened a meeting in Abuja, where the host country Nigeria and several others announced that they too would lower sulphur limits in diesel to 50 ppm. Sulphur is just one particulate among many. Thousands of chemicals spew, spray and spurt into the air every day, all over the world. So far, the main mode of mitigation has been to legislate substance by substance – a laborious and inherently inadequate approach. Plus, tighter regulation is only one step. Enforcing rules requires extensive infrastructures: government agencies, experts to staff them, labs and monitoring networks, data-processing capacity, and much more. All this costs money, putting pressure on already strained state resources. Furthermore, it would be foolish to assume that companies will obediently comply with new rules. Recall the diesel scandal of 2015 in which Volkswagen was caught using ‘defeat devices’ to falsify nitrogen-oxide emissions in laboratory testing. Other manufacturers engaged in similar practices. In the face of emission controls aimed at limiting Anthropocenic damage, such tactics seem like polluters’ middle-finger response. And some are much larger than a little sensor in an engine. Regulatory arbitrage is a defeat device that operates on a planetary scale. The oil industry complies with tighter restrictions on some continents by offloading dirtier fuel on others. Diesel vehicles that no longer adhere to European standards end up in African cities, increasing the incentive to export highly toxic fuel. Ultimately, all the pollutants end up in the atmosphere, driving climate change. But along the way, some people pay a higher price than others. This is why understanding the Anthropocene requires tacking between particular places and planetary perspectives. But words have such power only if they’re widely adopted, and it’s hard to imagine geologists or climate scientists embracing alternatives. The political leverage of the Anthropocene concept lies precisely in its analytic potential to bring together researchers across the natural, social and human sciences – as well as the arts – in order to better understand the complex dynamics that put our species at risk. Obviously, capitalism plays an inescapable role in these historical and biophysical connections. But it is too blunt and inadequate a tool for analysing many of the other dynamics that shape these connections: hydrological patterns, radioactive particles, security imperatives, informal economic activities, and much else besides. We need social scientists and humanists to trace the connections between North American cars and African lungs. But we also need natural scientists and medical doctors to detail the molecular compositions that make air and water toxic to biological life. Putting these studies in conversation under the rubric of the Anthropocene clarifies connections between planetary and individual suffering. It shows the importance of attending to both simultaneously. To be sure, understanding and acknowledging complexity does not suffice to address harm. But it’s a crucial step. 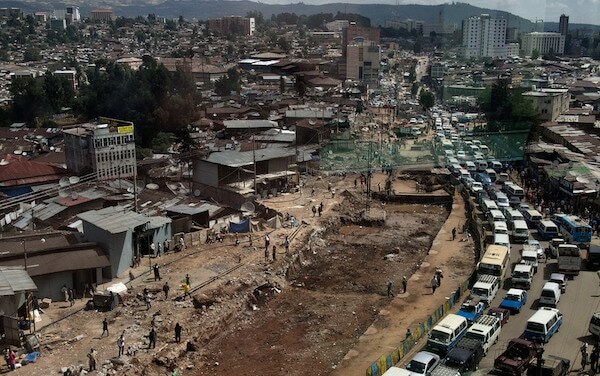 Confronting the Anthropocene, in Africa and elsewhere, requires fresh sources of imagination. And these sources must be found at the frontlines of planetary transformation – from the urban advocates for cleaner air and water, to intellectuals who challenge European and North American paradigms for studying the world. That’s why Africa plays a huge role not only in our planet’s present, but also in its future, as the Cameroonian philosopher Achille Mbembe, the Senegalese economist Felwine Sarr and other African scholars have argued. Africa is the continent where population growth is projected to be the highest. It contains 60 per cent of the world’s uncultivated arable land. Some pockets of Africa lie at the forefront of decentralised energy systems (such as solar power) that promise to mitigate climate change. And that’s only for starters. If the Anthropocene is to have real value as a category of thought and a call to action, it must federate people and places, not just disciplines. It requires thinking from, and with, Africa. ‘They’ are ‘us’, and there is no planetary ‘we’ without them. Gabrielle Hecht is Frank Stanton Foundation professor of nuclear security at Stanford University, where she is affiliated with the Center for International Security and Cooperation (CISAC) and the department of history. She is the author of several award-winning books, including Being Nuclear: Africans and the Global Uranium Trade (2012). She lives in San Francisco.